Wind Point, Wisconsin (Jul. 21, 2016) The Prairie School’s Head Boys’ Varsity Tennis Coach Harold Swanson has announced his decision to retire, marking the close of an iconic career that started in 1970 and spanned five decades. Revered both within the Prairie community and throughout Wisconsin for his tennis acumen and ability to instruct, Swanson’s players experienced great success on the court while growing into compassionate, well-rounded individuals while under his tutelage. “My goals in coaching tennis were always to help my players improve their game and become better people,” Swanson said. Upon his arrival in 1970 as a Middle School Social Studies teacher, Swanson started both the boys’ and girls’ tennis programs at Prairie, and served as Boys’ Varsity Head Coach until this week. In addition to numerous Conference and County Championships, his teams won six State Championships and his individual athletes garnered over fifty State recognitions. 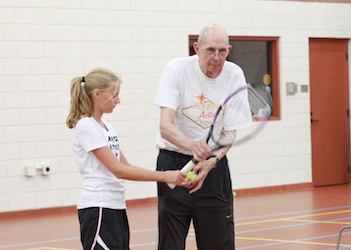 Additionally, the summer tennis camp he developed in 1970 continues to draw aspiring players from the Racine community. Although Swanson retired from teaching Social Studies in 2001, he continued to serve as the Head Boys’ Varsity Tennis Coach. In 2013, he was recognized as the Division II Coach of the Year by the Wisconsin Tennis Coaches’ Association, and in 2014 he was inducted into the Wisconsin Tennis Coaches’ Hall of Fame. While his accolades and accomplishments were many, Swanson’s most important strategy was on helping his protégés become better people – after that, winning came naturally. One of the most revered personalities in Prairie history, Swanson’s legacy will live forever. His passion for tennis, and for the students under his care, will never be forgotten.